Lake Fork is without a doubt one of the premier destinations for a host of species in the United States. The usual suspects come to mind; Largemouth Bass, Black and White Crappie, Channel and Flathead Catfish, White Bass, and others. What people don’t know is that Lake Fork is also one of the best destinations in the United States for massive Smallmouth Buffalo, Mirror Carp, and Common Carp. Small mouth buffalo guide Austin Anderson is putting clients on 50+lb small mouth buffalo in Lake Fork Texas. Fork is somewhat unconventional when you compare it to the waters generally thought of as carp waters in Europe and other parts of the world where they are revered as prized specimens. It stretches a massive 27,000 acres across the piney woods of East Texas. Fork is loaded with natural cover, huge expanses of flooded timber and other structure. It’s literally a paradise for fisherman of any kind. So what makes Fork so special? Lake Fork has huge fish, simple as that. The nutrient rich waters are loaded with food and the large amounts of predator species help keep the numbers of carp and buffalo in check so they have the capacity to grow very large quite easily. Fork regularly produces carp over the 30lb mark and frequently produces buffalo in the 50lb and up range. 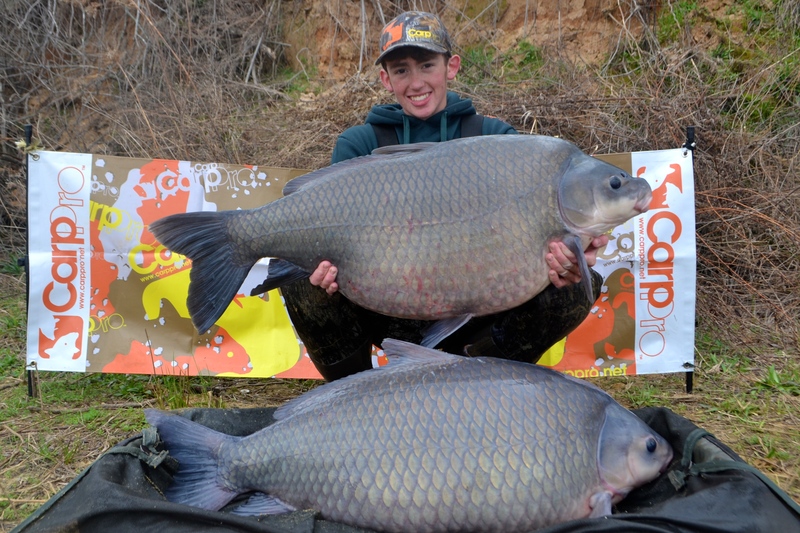 The largest Buffalo and Common Carp captured are an unbelievable 68lb 7oz and 40lb 4oz respectively. 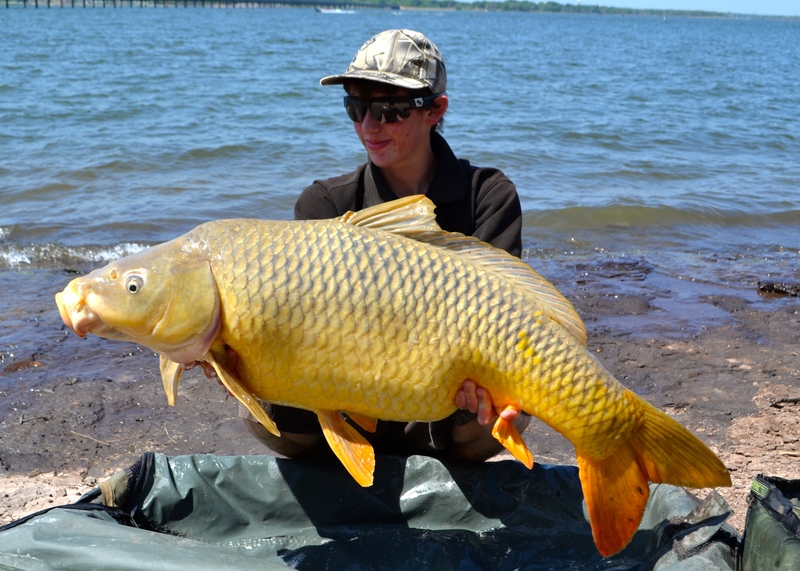 Lake Fork Carp Fishing Guide Austin Anderson is catching massive wild common carp. Lake Fork is also home to the now world famous Texas 44 Lake Fork Carp and Buffalo Challenge, hosted by Wild Carp Companies (www.wildcarpcompanies.com) and CarpPro magazine (www.carppro.net). 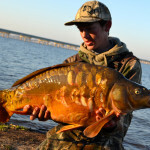 In the past three years, the competition has brought world fame onto the lake, with anglers coming from all over the US and even as far as Hungary, Romania, Italy, South Africa, Canada, and the United Kingdom to fish in the competition. 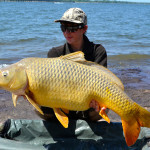 The Lake Fork Sportsman Association and the tournament is having a huge affect in promoting and introducing carp fishing to the area around Lake Fork. Lake Fork isn’t easy, however. The water is loaded with snags and the fish are extremely strong. You have to be prepared to put in hundreds of pounds of bait in order to keep the fish in your swim and the trips can be grueling sometimes due to the sheer numbers of fish that can possibly be banked on a session. Fork really is paradise for the big fish angler. I have been personally fishing Lake Fork for coming up on three years for carp and buffalo. I have put in a huge campaign over the past three years, logging as much time on the bank for Carp and Buffalo as basically anyone. 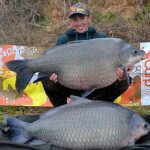 My massive campaign has paid off for me in the long run, with numerous breaks on my personal bests and, along with my partner Shane Hine, a win of the Big Four Carp division of the Texas 44 in 2013 and third place on big four buffalo in 2014. Lake Fork Texas also holds some rare trophy mirrors as well as buffalo and common carp. My achievements on the lake include a Smallmouth Buffalo of 63lb 3oz, my personal best; the IGFA junior world record Smallmouth Buffalo at 50lb 6oz; and most recently, a Common Carp of 36lb 10oz. 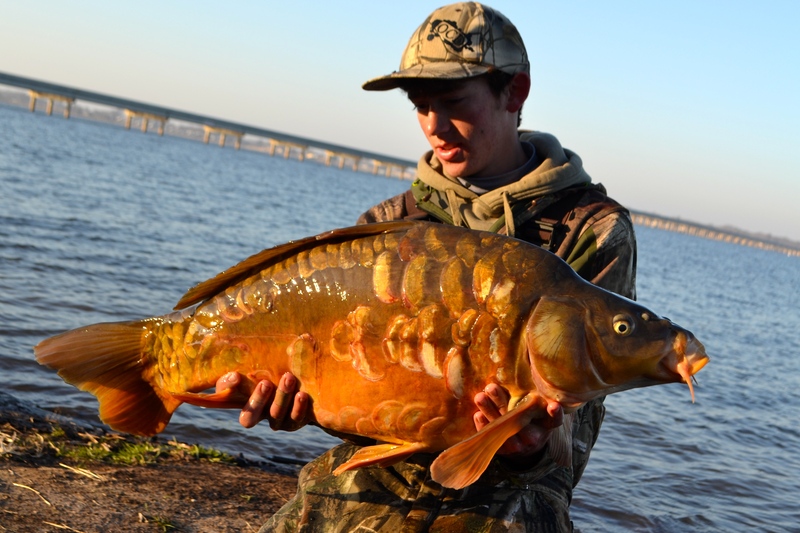 I’ve also had some special fish, including a few of the extremely rare and notoriously elusive Israeli strain mirror carp that can be found in certain areas of Lake Fork. Lake Fork is known as a world-class carp and buffalo fishery, and it is definitely worth the trip down to fish it. If you are interested on information on fishing the lake, I operate the only guide service in Texas specializing in carp and buffalo employing English and European tactics. I offer trips for short day sessions up to twelve hours, and also long weekend sessions lasting forty hours or longer. All gear, bait, food, and drinks are provided.